What did I say about birds... they are EVERYWHERE... I am very honored to be included in another treasury and it's about BIRDS.. now what did I saw.. they are just so popular and definitely the next trend in line after the OWL frenzy. 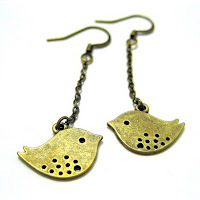 This treasury "The Bird that Chirped" is perfectly selected by tarunjain! 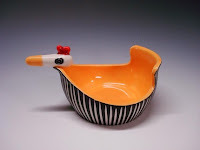 Modern Chick Bowls Orange Black white by shoshonasnow - I am into bowls.. and this one is so brightly colored (orange with black white stripes) with a cute chick head... Love the details at the bottom of the bowl as well. I can totally feel how much effort and love the crafter has put into this item. 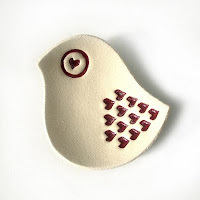 I love little birdie things! Great picks! Congrats! I love birds and these are great items. Congrats! It's quite something to be part of the Etsy treasury. Hey i just visited your store, your jewellery are sooo cute! I'm going to buy the snow white necklace! Great finds. I love the modern orange bird bowls! Very different. What's In Your Shopping Bag? Packaging - Are you a sucker?